ATTENTION: This house is no longer for sale. 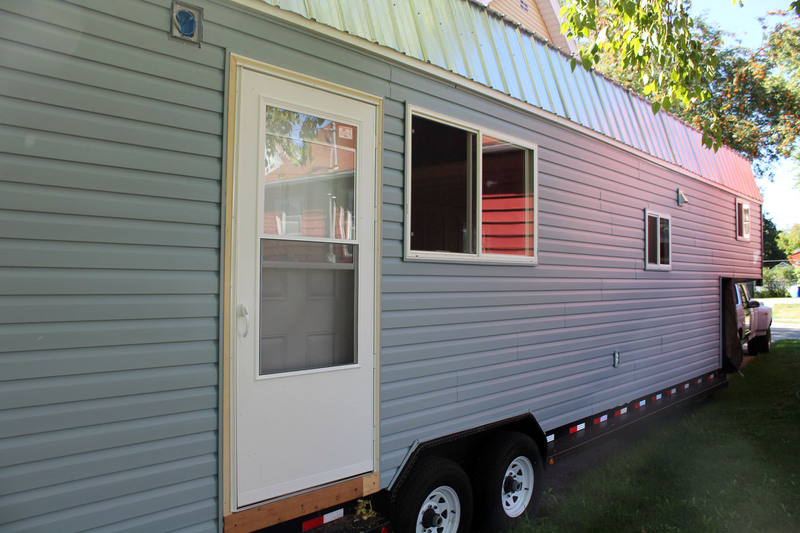 Beautiful “Family-Sized” Tiny House on Wheels. Great for simple living. Put your finishing touches on it. ~300 sq. ft. with loft area. 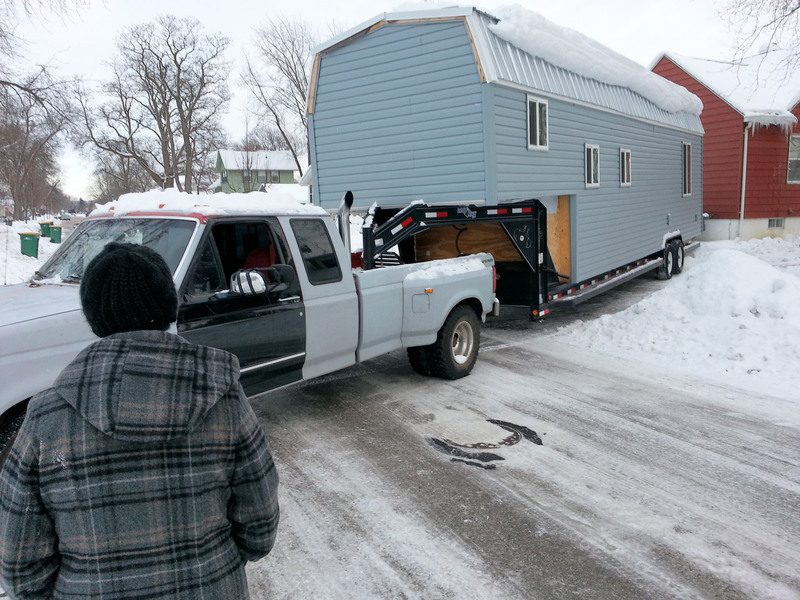 32′ gooseneck Loadmax trailer… house extends above gooseneck an additional 6 feet. Gorgeous Vaulted Ceiling in the Main Living Space helps the whole house feel spacious. Has a “Master Bedroom” just big enough for standard queen size bed. 12′ long loft area can accommodate multiple mattresses. House is wired with CAT6 cable for networking needs. plus “whole house” speakers. Pineboard wall finish in all rooms. 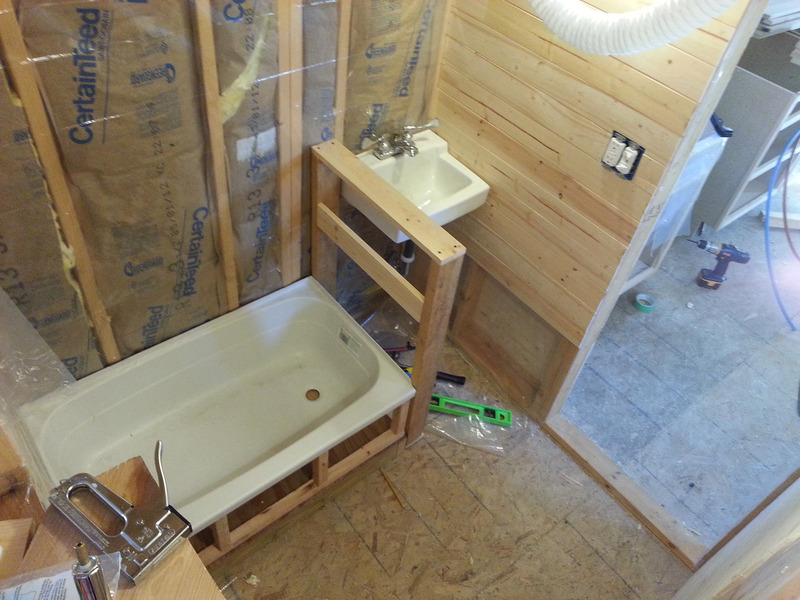 RV tub and shower head. Bathroom Sink. Loveable Loo composting toilet. 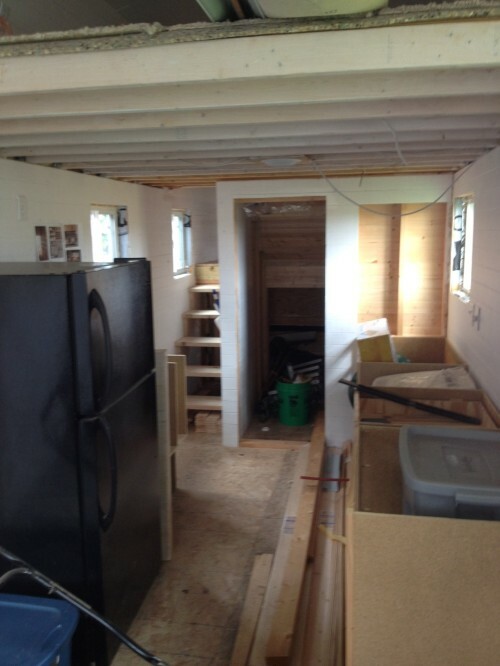 Storage crawl space under stairs and bedroom. Also ideal spot for water heater. Energy efficient full sized Refrigerator. LP cooking stove and oven. 3 burners. Ceramic Convection wall-mounted electric heater. House isn’t quite fully finished. 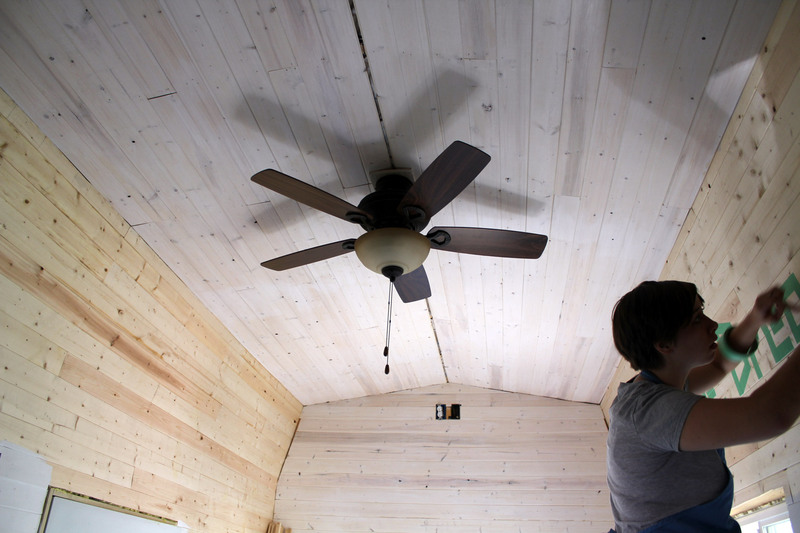 It is at a great point for someone to come in and put personal finishing touches on the house. Cabinets started, but needs drawers and counter. 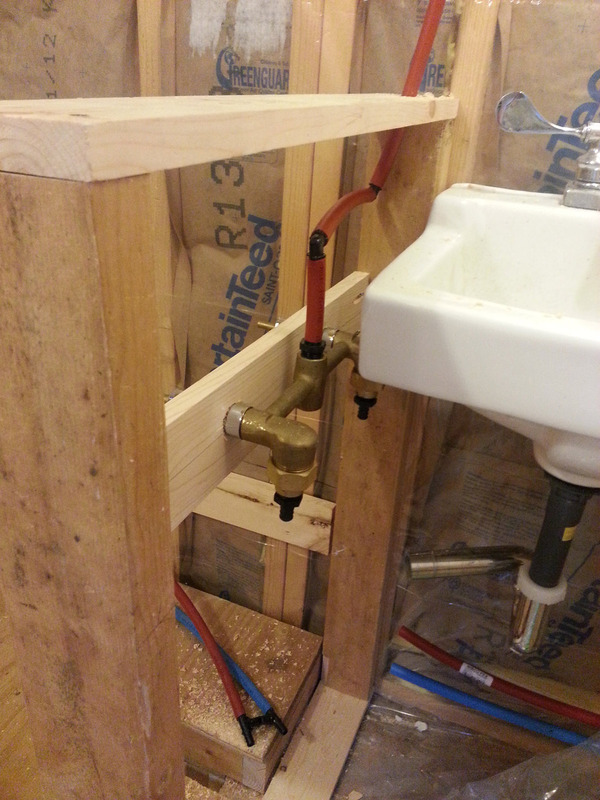 Water pipes are run but need to be Crimped and set (PEX). what are you looking at for a price? I’m sharing your post with all my friends. Thanks Laurie! We are asking $18,000. I have been thinking about you guys recently and was wondering what you were up to, hopefully the move went ok and your new arrival has been getting bigger and stronger every day! I am sad to see you having to sell your tiny but I know someone is going to be VERY happy to pick it up! I will definitely share this as well, have to ask, did you put it on tinyhouselistings.com, people have been having good luck on there lately! Hope everything is amazing for you guys! Thanks so much Macy! We are also sad that we have to sell our house, but that is our best option right now. Hopefully we’ll be able to design and build a new one here in Oregon. Thanks for your help and encouragement! We did indeed put it on Tinyhouselistings.com. 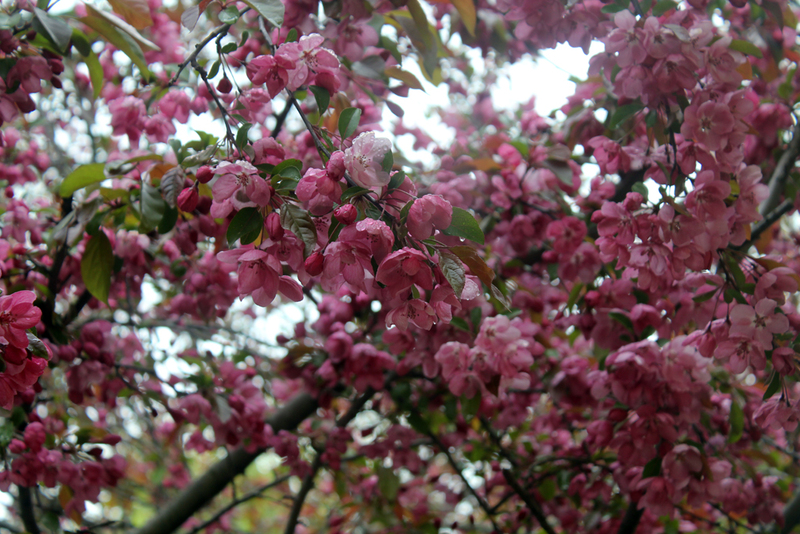 It can be viewed here. I can’t seem to remember the username and password I created though, so I’m unable to update the listing and price. Great to see all the cool things going on in your world! Gonna be a mama soon. Woohoo! I located Lomira WI., on my map of Wisconsin, but you said in your post above “Hopefully we’ll be able to design and build a new one here in Oregon. Is your tiny home in Wisconsin or Oregon? I am in New York state, big difference road mileage wise between the two. I really like what you have accomplished. I understand it is unfinished, but that is just an unfinished symphony, the music will sound just as sweet when it is completed. 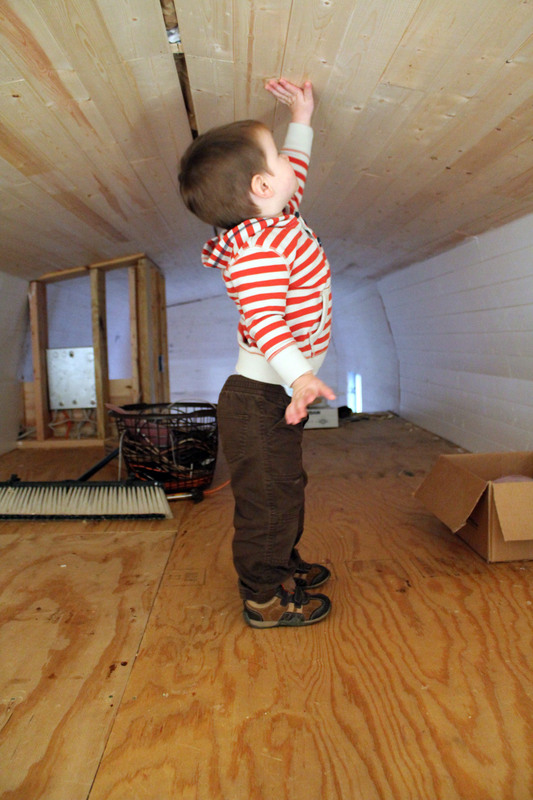 Petey Boy, I love the picture of your son in the loft stretching to touch the ceiling…made me smile. I don’t know why you are selling, but in any event I wish you and your family godspeed on life’s journey, I believe that at some point you will build another tiny house. 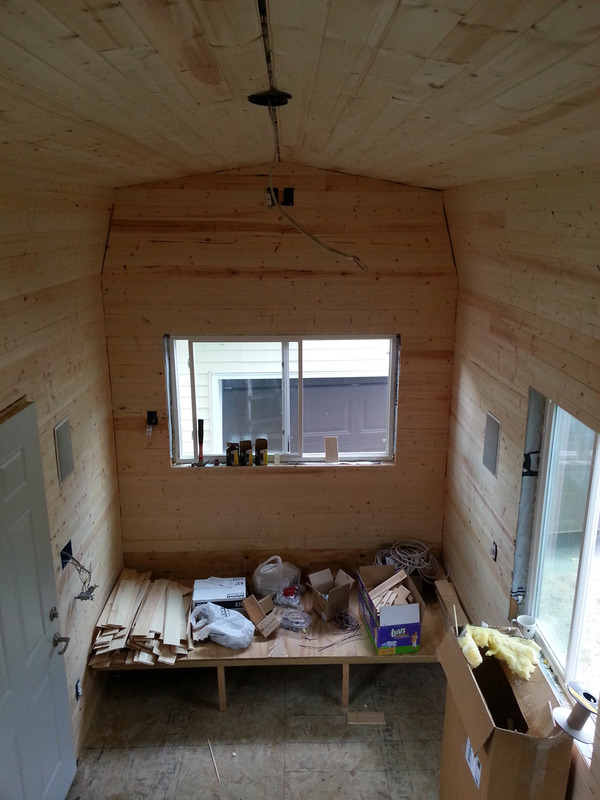 Look at all you have learned with this tiny house. Whoever is the lucky person to acquire it, will be getting a lot of house for the money. Plus they will have the benefit of having a conversation or two with you, the designer/builder. Being able to speak with you and hear your hopes, dreams, history with this tiny home will be priceless. Am I interested? Who would not be. I just purchased a 2003, 6.0 turbo diesel Ford F250 equipped with both a bumper/frame and a goose neck with all appropriate electronic control devices. Good luck with your offer. but put me on your dance card just in case (lol!). I am located in Oregon. The Tiny House is located in WI. Part of the reason we are selling it is because we thought we’d be able to bring it with us to OR. But we’ve had trouble trying to find a place for it to land AND the cost is more than we can afford right now. We figured it doesn’t pay to let it sit for any more years while we get things figured out. Thanks for your encouragement, I’ll keep you in mind if the original deal falls through. Should have everything wrapped up in about 2 weeks. I’ll know either way then. Just wanted to let you know that we have officially sold the Tiny House. Thanks for your interest. Thanks for sharing your insight. I do believe that you could build a fully finished Tiny House for 13,200 and I welcome you to do so. For folks that don’t want to build it themselves or want to just doing the finishing, this house is perfect. Each person builds their own home to its personal taste and that is how different price points come about. Simple math. I believe for the size of your tiny house your price is very very good. This is by far the most innovative design for the gooseneck trailer i have seen. I am impressed with the way you used the space over the hitch and then the overall floor plan. I do not know how you planed to furnish the living area or place the utilities; how did you plan the weight distribution across the trailer? Trolling aside Rick needs new batteries for his calculator. Hahah… then do it. And MYOB. That’s Mind Your Own Business for people who are ignorant, or just rude, and have to make a negative comment when one is totally unnecessary and inappropriate. In response to Rick (above), I am certain he can build a tiny house on a trailer for $13,200. I have not done a cost analysis of your tiny house, but I did check the Texas Pride trailer site and found a new 24 K Goose Neck Flat Deck Triple Axle Low Boy Equipment Trailer on sale for $7,595. Granted you may well find something similar on eBay, I emphasize the term ‘may find’. The trailer I saw was only a 24′ long unit. A 32′ would be substantially more, emphasizing the inherent value, built into your asking price. Stick to your guns Peter, you are in the ballpark. Do you still build these tiny homes? If so can I get some contact information from you? Hi, I know I am a bit behind, but my husband I are planning on building & living tiny very soon. We stumbled on this website while doing other research & we love what we can see of this awesome tiny! Do you have any more pictures of the finished product? We are especially interested in the loft within the loft. Any extra tips or pictures you have would be much appreciated. Thanks again. Hi Kristen, We don’t have a ton of photos of the loft, but you can see a few more here. Thank you so much! For what it’s worth this is the best tiny I have ever seen! You truly do great work! Thanks agian. Great build! It looks much taller than standard THOWs. How tall is it? Did you have to do anything beyond getting oversized load permits in order to move it? I’m thinking of going a little taller for my THOW and would appreciate any insights you have. It was about 13’7″ tall. We wanted it under 13’6″, but miscalculated. We didn’t get special permits when we moved it because it was with in the proper standards. Most of the time, under 14′ is okay. At least, that was my understanding at the time.